Nothing spoils a sporting event like a sore back or behind, which is why we offer a large variety of football stadium seat products. Our football stadium seat products come with the logos of dozens of professional and college teams, such as: UCLA, Iowa State, West Virginia, Arkansas, Boston Red Sox, Minnesota Twins and more. Our stadium seats have Velcro straps to secure them to a bleacher set and also have a durable top-handle, which makes them easy to carry. Of course, a stadium seat can also be used on a camping excursion, as it’s a great way to transform a rock or tree stump into a comfortable seat. 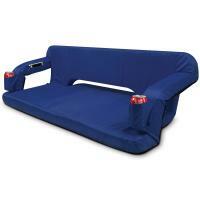 Not sure what football stadium seat is right for you? Call or email our friendly customer service staff and they’ll be happy to help you pick one out. 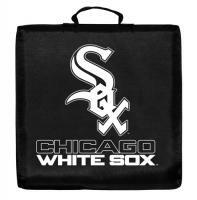 These stadium cushions were a gift to my kids and I know they love them. They gave a lot of basketball and soccer games to go to. I really have enjoyed the stadium seat. It is light weight and easy to carry. These chairs are sturdy and comfortable and way worth the money. Nice item for football games. Thanks. Exactly what I was looking for and being used regularly. Portable recreational recliner seat is great. I take it to my husbands softball games so I have a seat with a back support. I've been asked a few times"where did you get that?" I love it. Bought these chairs for my son and daughter-in-law. They were a great surprise and will be used a lot at games.